Chevron boasted recently of moving from exploration to development in the Fox Creek area. Earthquakes quickly followed. 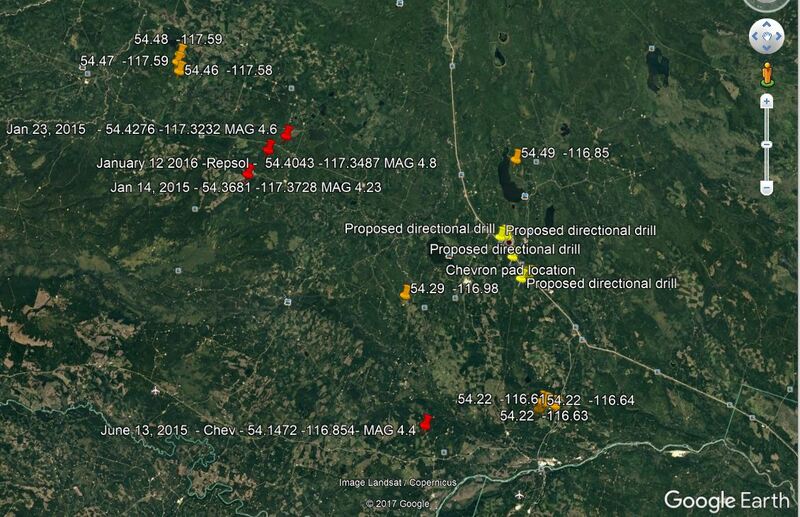 Locations (as initially reported, locations may change pending further analysis) and earthquake data collected and mapped by Barb Ryan, of Fox Creek. Data from NRC. Chevron intended to directionally drill and frac under the Town of Fox Creek. The town has already suffered extremely expensive water quality and quantity problems. Chevron moved their bottom hole to town boundaries. Will the AER ensure the protection of the community, families living there and workers? No. As usual, the legally immune, Charter violating, deregulating “regulator,” whose mandate no longer includes the public interest (as of 2013), will only serve and protect the quake causing companies. As the province’s economy comes out of recession, towns in the heart of Alberta’s oil and gas sector are starting to see investment begin to flow again. Tom Vernon has more from Fox Creek. Former postdoctoral scholar Yihe Huang, now at the University of Michigan, also co-authored the study. Beroza and Ellsworth are co-directors of the Stanford Center for Induced and Triggered Seismicity(SCITS) at the School of Earth, Energy and Environmental Sciences. 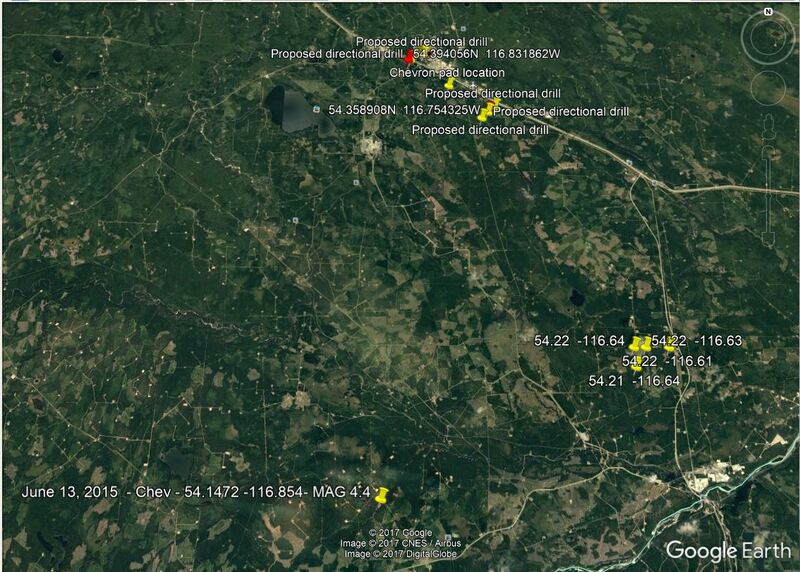 We analyze the background seismicity, initiation, and earliest stages of the Guy-Greenbrier, Arkansas, earthquake sequence, which was potentially induced by wastewater injection starting in July 2010, during the 3 month time period 1 June to 1 September 2010. High-resolution observations of low-magnitude seismicity, and the high-quality Arkansas public well database, facilitate detailed analysis of spatial and temporal correlations between earthquakes, wastewater injection, and hydraulic fracturing. We detected 14,604 earthquakes, with magnitudes −1.5≤ML≤2.9, using two sensitive, waveform similarity-based event detection methods in parallel: Fingerprint And Similarity Thresholding, and template matching. We located the 1,740 largest earthquakes that form 16 spatially compact clusters, using P and S phases from 3 stations with the double-difference relocation algorithm and an improved velocity model constrained by the location of quarry blasts. We enhanced the temporal resolution of these event clusters by assigning smaller unlocated events to a cluster based on waveform similarity. Most clustered earthquakes during this time were both spatially and temporally correlated with hydraulic fracturing stimulation at several production wells. For one cluster, microseismicity was correlated with individual stages of stimulation. Many other wells had no detectable nearby seismicity during stimulation. We found a smaller number of events located on the Guy-Greenbrier Fault that were likely induced by wastewater injection. 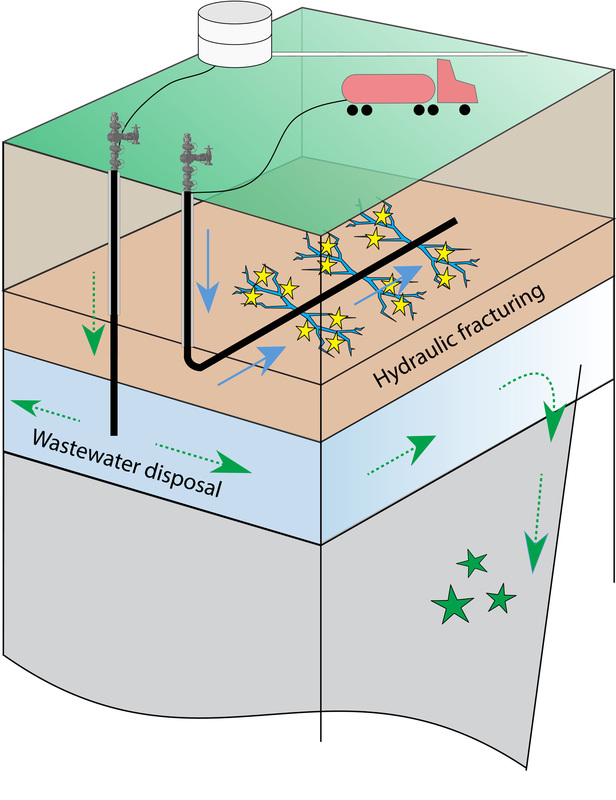 The concurrent presence of seismicity induced by hydraulic fracturing and wastewater injection presents a challenge for attribution and seismic hazard characterization, but the combination of precision seismology and high-quality well information allows us to disentangle the effects of these two processes. 2015 11 15: More lies & frac fraud? Why did AER’s Darin Barter (now NEB) suggest trucks to blame for citizens feeling frac quakes at Cardson? Why not tell the truth? Why are regulators and “experts” so loath to publicly disclose fracing’s many public safety risks? 2015 09 18: How much has Fox Creek paid for hauled water? What happens when Fox Creek runs out of money? Will Encana step up like Bonavista was ordered to?